I like the plot and concept of the series, but the main character is sort of idiotic and annoying for being a really smart puzzle solver. After the first few episodes, the series gets good. I also wonder why the main character is the only one in the school that doesn't wear a uniform. I've certainly seen shows with stranger concepts, so a kid who works for a secret society of puzzle-solvers isn't outside my ability to accept. Hikaru No Go springs to mind as an example of a very unlikely concept working out; an anime about a kid possessed by a spirit of an ancient Go player who spends most of the show playing Go, which is not exactly a spectator sport. And yet that show was engaging, both because of its entertaining characters and its use of actual Go games. Phi Brain fails in both the ways Hikaru No Go succeeds. It's support characters are generic and dull, and the main character is straight-up annoying. No one likes an arrogant, over-competitive yet lazy punk. There's just nothing to empathize with there. As for the puzzles, this was a massively missed opportunity. Instead of showing the viewers how the puzzles are solved, the kid just puts on his magic bracelet and cool music plays and BAM! puzzle complete. This is barely acceptable on the extremely complex puzzles such as the water pulley puzzle, but in the second episode when he's running up to the roof solving puzzles as he goes along (side note: why did he bother solving the puzzles? there was absolutely no reason for him to waste time with them when he knew the person he was after was on the roof, and the puzzles offered no challenge in the first place) none of the puzzle solutions are shown. The whole point of the show is puzzle solving, but the writers are too lazy to actually reveal the process of solving the puzzles. With no interesting characters and no technical puzzle-solving, what Phi Brain is left with is an obnoxious lead character essentially using magic to solve life or death puzzles...for the sake of solving puzzles...for the weird secret society that apparently has nothing better to do with its time and ridiculous resources...yeah. There's just nothing here; neither in the entertainment or the intellectual department. Strongly do not recommend. Honestly, I had no hopes. I just saw something about puzzles and my puzzle mode too over. I enjoyed Phi Brain season 1. I found it fun and addictive. I generally enjoyed the characters, especially the quirks of Cubic and Ana. The anime has energy and heart. I thought it was well written though I wish they had slowed a bit or given us more time and info to solve the puzzles ourselves. It would have been nice if they had included a watchers puzzle. That's pretty much my only complaint. Phi Brain was pretty entertaining. Phi Brain particularly caught my interest with its crafty style of blending puzzles (which I am so-so at), mathematics (which I am okay at) and logic and analytical thought processes at very high speeds (which I enjoy dissecting later on at more comfortable ones). Whereas most anime merely just give the viewer questions and thoughts about how the series is turning out, I think Phi Brain lets your own interest in it determine how it will be for you. I originally found the first episode a bit hard to swallow, it was complex, dead ended me with the advanced concepts hardly being explained yet somehow miraculously being performed, and it ended on an a sour note. It was only a day or two after watching the initial episode did I return to the series, and it really sparked something in me. Whereas the other reviewer said that it was lacking in explanation (which I agree with), and that the main character was crass and highly unlikable, I believe the opposite for his second point. I've gone into a series gawking at how unlikeable a character can be, only to later grow attached to them (and not in the love-to-hate way either). It is a complex character development which takes place throughout the events of Phi Brain Season 1, culminating in Kaito's stubbornness to cause harm to Rook even in the event that he might die in the process of saving him. Where I agree that Kaito is crass and arrogant at best, and impossible and scornful at worst, he is still supposed to be a human being. I believe that Season 2 really captures the human element the best, and projects it onto Kaito through his companions. I believe that the injection of the human element into the series also shows the intense risks associated with becoming too focused on one concept (like Kaito's mind on puzzles when nearing the Phi Brain state) and the mental distress that can result from not properly socializing with others during key developmental stages (Kaito and Rook). While the support characters are a little flimsy at first, their development curtails with the major events of the story as it progresses onwards. I think that it is a notable feat when you can think about a series with latent romantic trappings (Kaito and Nonoha, which I really hope they figure out), a desire to consider all of the characters within it, and an increased interest to investigate the topic of its narrative. I wouldn't say that there is a learning curve associated with this series, but hopefully you become further interested in mathematics, puzzles, the brilliance of the human mind, the frailty of the human psyche, the compassion of others and how it shapes a person, and finally how even insurmountable odds are far more conquerable with the right group of people on the sidelines cheering you on. It makes me hope that everything works out for the characters, imagine what life would be like if I were as good at puzzles, laugh at the totally implausible shadow puzzle agency run by a teenager, and think about just how the writers came up with the ideas throughout. I recommend anyone to give it a try, and even if you don't like it the first time, try to let it grow on you. They often say that the things which stay with you the most don't always pique your fancy the first time. There's something to be said of a series that you need to let ruminate, and even try investigating. It's enthralling. I agree with Crazedjedi. The show would have been better if the story and puzzles weren't quickly solved. There was really no "challenge" for the main character or even the viewers to engage in due to how quickly his power kicked in. Personally I would believe Phi-Brain could have brought more viewers not only of a younger age but older as well, only if the story brought more than your regular story line. The story line that I am talking about is the protagonist and antagonist previously knowing each other. For me, the idea of solving puzzles was different, which was the reason why the show immediately caught my eye. I was displeased to see how fast each episode went. It's as if the whole plot is focused on the mysterious bracelet that the main character was given. There was no depth and the script and in my opinion it was poorly written. I stopped watching after the 6th episode. Puzzles can kill people. At least, then can when created by the "wrong" hands so to speak. That's basically the principle at work here. The show is shounen style, with puzzles and "genius" solvers and givers as the protagonists and antagonists. There are many flaws with the story line, and it's never very smart. I think it skews to the younger crowd, which isn't bad because there's also very little fanservice. The moral of the story is love conquers all, be yourself, and yes, your friends can save you. All the stuff they drum into your head as a kid. I watched the show because I enjoyed the dynamic between the characters. Also, I wanted to see just how far they would stretch the whole "killing puzzle aspect". There was a resolution of sorts, but now there's a second season. I'm afraid these puzzles will go on and on. So I had high hopes for this anime. I love the studio and the premise seemed great. The first couple of episodes were okay but I feel the story is just dragging. Filler episodes with side characters already? It's not a good sign when I cringe about having to watch the next one but hoping it gets better. I'll keep trudging in hopes that my sacrifice keeps getting repaid with wonderful anime like Fate/Zero. If you're short on time, stay away. I am avid puzzler solver and an semi-pro chess player. 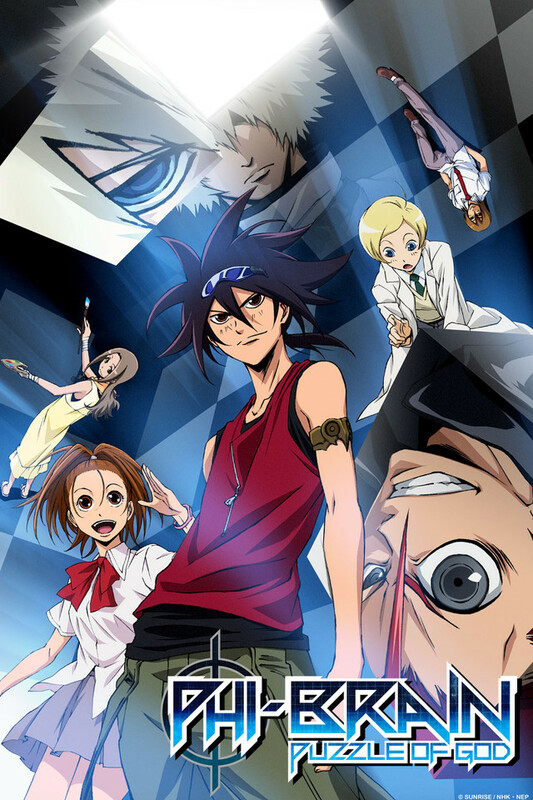 Phi Brain is an innovative anime the hero is more brains than brawn, plus his friends are very gifted and unique. Love the concept and show I recommend it for anyone looking for a little something different.